With the heat pump installed, the next task was to install the flow center. Actually they put it in before the heat pump but didn't make any connections. But I think it makes more sense to discuss it here. 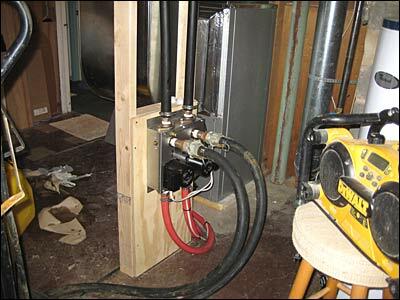 The flow center consists of two pumps connected to the ends of the ground loop tubing. One pump pulls the water/methanol mixture toward the system and the other pushes it away. As I recall, they are moving about six gallons a minute and don't use very much energy. 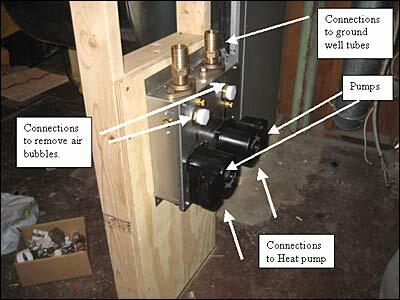 The flow center sits between the tubing outside the house and the geothermal heat pump. First, they needed to install a structure to support the flow center. This was necessary to ensure system stability. 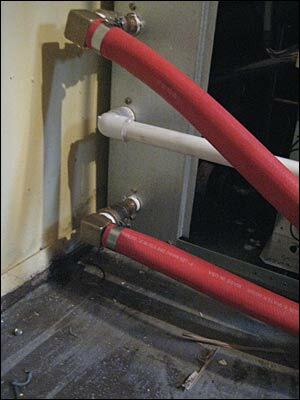 From the flow center, the red hoses carry the water/ethanol liquid to the heat pump compressor. Here they are connected to the geothermal heat pump main unit.